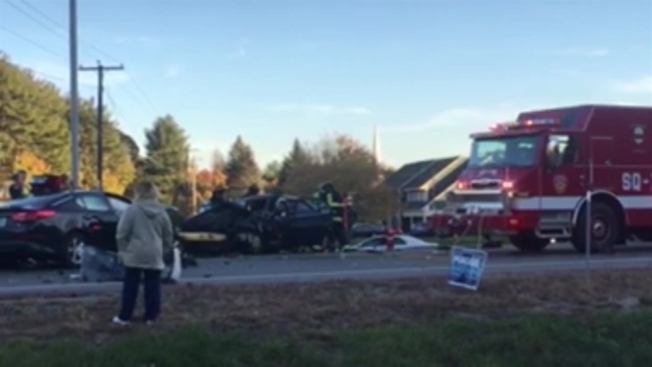 Authorities say a man has been arrested after woman was killed and two people were seriously injured in a crash on state Route 111 in Salem, New Hampshire. Forty-five-year-old Todd Gurley of Hampstead is facing multiple charges, including negligent homicide, aggravated DWI causing serious injury, heroin possession and falsifying physical evidence. Police say Gurley's vehicle, a Honda Accord, was turning westbound onto the road around 4:40 p.m. Tuesday when it hit a Kia Optima that was traveling westbound through an intersection. The force of the crash pushed the Kia into oncoming traffic and it struck a Toyota Camry. Police say a 69-year-old Atkinson woman, a passenger in the Toyota, was pronounced dead at the scene. The driver, a 58-year-old man, was airlifted to a Boston hospital with injuries considered life-threatening. The Kia's driver was hospitalized in Manchester with life-threatening injuries. Gurley was treated at the scene for minor injuries. He was held on no bail overnight in Rockingham County Jail, and will be arraigned Wednesday. It's unclear if Gurley has an attorney. The names of the Atkinson woman and the other injured people have not been released.